The Azores Islands are a treasure in the middle of the Atlantic Ocean. These islands are quickly becoming a hot destination to visit. The combination of outdoor adventure and Portuguese culture make for an incredible vacation. 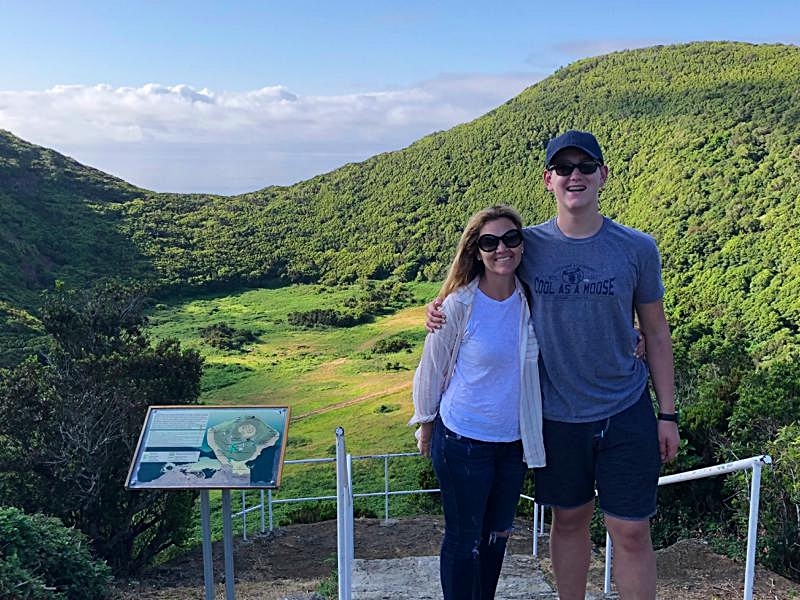 My son and I decided these incredible volcanic islands were our summer destination. With Delta offering seasonal service from NYC to Sao Miguel, it is easy to get to the Azores from the United States. We decided to spend a week visiting Sao Miguel and Terceira, 2 of the 9 major islands that comprise the Azores. Both flights and ferries connect the islands, so inter-island travel is also easy. We fell in love with both of these magical islands. But our hosts, Jo Meneses of Body Roots and the people of Sea Adventures, truly made our stay on Terceira special. We were so grateful to spend time with our Azorean friends who shared the beauty and culture of Terceira with us. Terceira is one of the largest islands of the Azores and has the second largest population. The island was discovered and settled around 1427; all the Azores were settled by 1508. 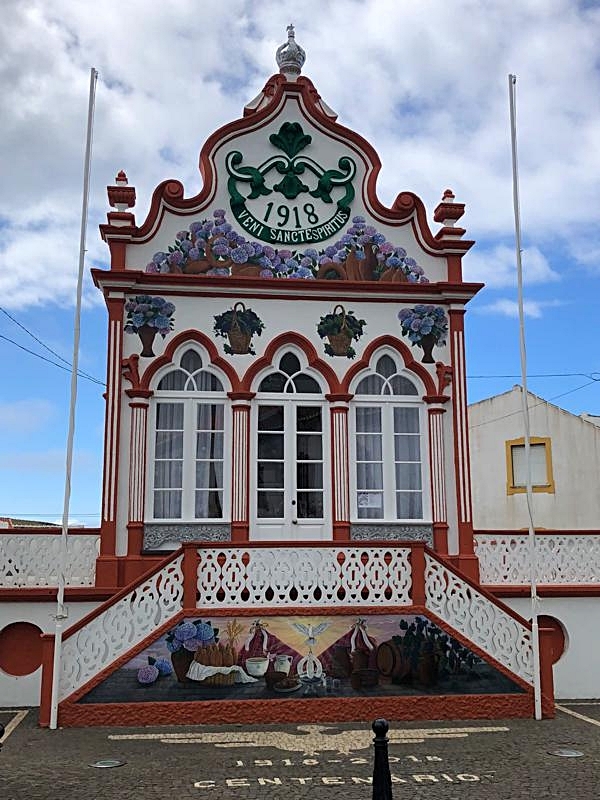 Over the centuries, Terceira has played an important role in Portuguese and world history hosting several prominent people. In 1583, the Catholic Diocese of Angra was established; Terceira was named the seat of the Bishop. In 1832, King Dom Pedro IV of Portugal visited the Island. Perhaps the most important visitor to Terceira was Pope John Paul II in 1991; he was the first pope to visit the Azores. In 2003, an emergency summit to discuss the Iraq attack was held at the US Air Force base on Terceira with President George Bush, British Prime Minister Tony Blair and Spanish Prime Minister Jose Maria Azner. While Terceira is rich in history, there are also many beautiful natural sights to visit. We were so excited to explore this island! We began our exploration in Angra do Heroismo, Terceira’s main city. It is the only place in the Azores designated a UNESCO World Heritage site. The city was given this name for two reasons: its location and an act of bravery. Angra means cove or bay where the city is located. Queen Maria II bestowed “Heroismo” on the town as a result of the heroic act of the citizens defending the island in 1829 against the Spanish. (Queen Maria II lived in exile on the island from 1830-33). The city is 1 of 3 capitals of the Azores each hosting one branch of the government. The city was a major commercial and military port. In the 15th century, The Castello do Moinhos (Fort of the Mills) was built on a hill in town. Today the Portuguese military houses troops in this location. There is so much to see in this town! Directly across from the Obelisco is Monte Brasil. This large mountain is the remains of a volcano. A fort sits at the bottom of the mountain. During World War II, the British placed guns at the top to defend the island from the Axis countries. Today two larger guns serve as a monument to Monte Brasil’s role in the war. 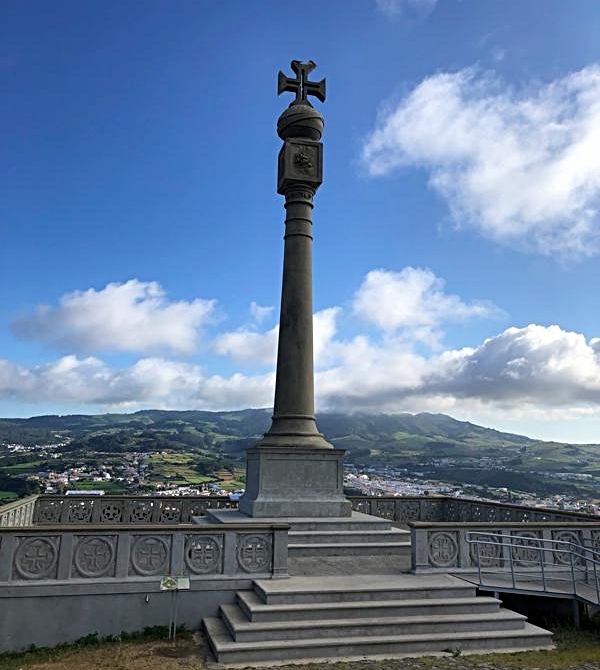 A stone monument also sits at the top to commemorate the role of the Azores during the Age of Discovery (when the Portuguese were exploring the world). Following the centuries old tradition, whale watchers (using high powered binoculars) search for whales at a station at the top of the mountain. Today the Monte Brasil is a nature park with countless hiking trails. 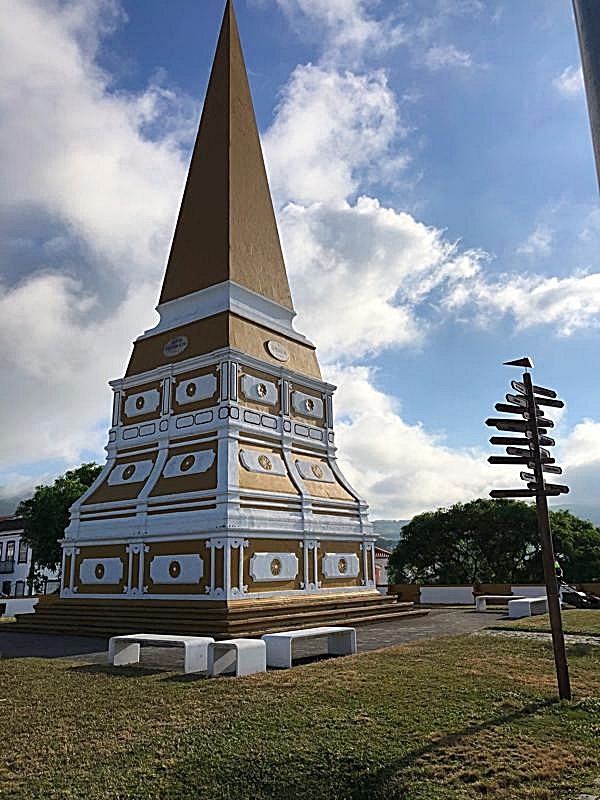 From either the Obelisco or Monte Brasil, the Se Cathedral is one of the most prominent buildings in Angra do Heroismo. Built during the 16th century, it took 42 year to complete. Located in the city center, it is the largest church on the island. The Cathedral was built on the ruins of the Gothic Style Church of the Holy Savior. It is an excellent example of the Arquitecture Cha style which features a simple, utilitarian style with two harmonious bell towers. The bell towers have 4 bells; the oldest bell is only rung when the bishop says mass. In 1991, Pope John Paul II marked his visit by saying mass in the Cathedral. A statue of him sits outside the Cathedral! From Angra do Heroismo, we drove along the coast to the Bay of Salga. 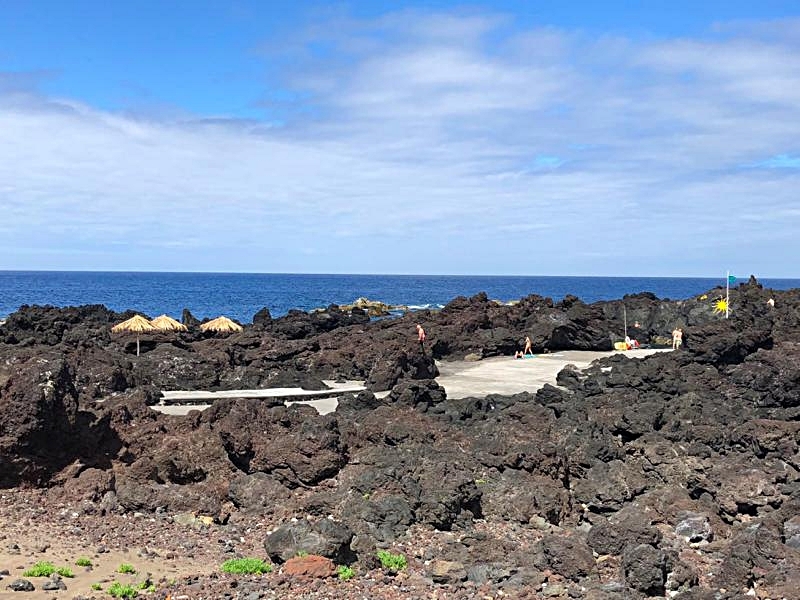 This beautiful, peaceful bay played a major role in Azorean history. In 1581, the Spanish forces of Philip II tried to conquer Terceira. They attempted to attack at the Bay of Salga. A group of local women led by Brianda Pereira thwarted the Spanish attack on July 25, 1581. The women released the island’s bulls from their farms letting the animals charge at the Spanish troops. The Spanish were driven back to their boats never setting foot on Terceira. A gorgeous tile painting on the roadside depicts the event. As a result of this event, bulls are revered on the island. Throughout the year each village hosts bullfights which are different than the traditional bullfight. A bull is brought to the village with a rope around its neck. The men in the village try to taunt the bull while controlling it with the rope as the bull runs through the streets. The bull is never killed and is only allowed to fight one day. When the event is done the bull returns to one of the farms in the hills of Terceira to rest! Near the Bay of Salga is the small village of Sao Sebastiao. Here we discovered the most beautiful Império do Divino Espirito Santo on Terceira. These small chapels are dedicated to the Holy Spirit (or Holy Ghost). This brotherhood devoted to the Holy Spirit began in the 16th century and continues today. In the 18th century, they became a major influence in unifying the people. By the 19th century every town had a permanent building devoted to the Holy Spirit. There are about 70 chapels on Terceira. The outside of each building is decorated with bright, cheerful colors with an imperial crown affixed on the top of the roof. On the inside, the chapel houses a silk covered altar, a silver crown (topped by an orb with a dove) and a scepter (with the silver dove of the Holy Spirit on top and white ribbon streaming from it). These buildings are charming! The Império in Sao Sebastiao is my absolute favorite- A must visit! Across from the Império is the Church of Sao Sebastiao. As a lover of church architecture and art, this church awed me. 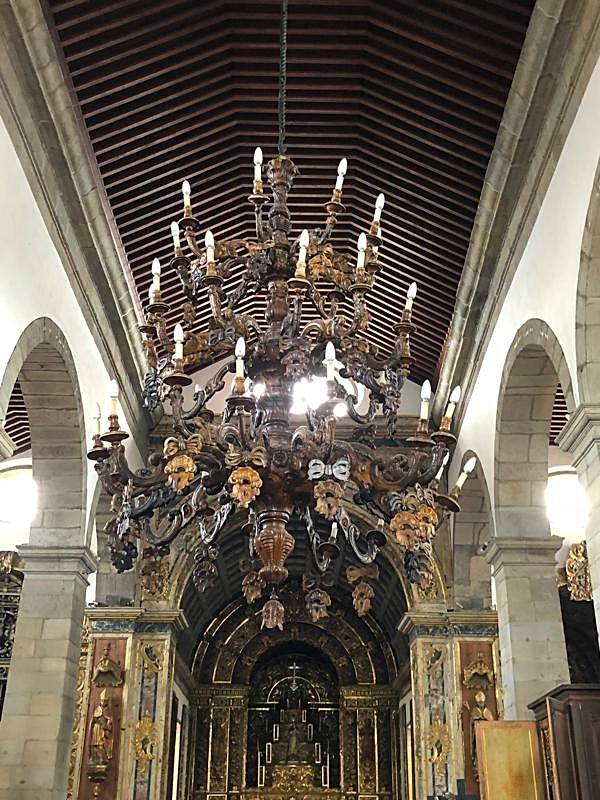 It is considered to be one the most beautiful churches but also houses some of the most valuable art in the Azores. The church was built in 1455 by the first settlers of the island. Its exterior is a classic Manueline style. But the medieval interior- with its arches, ribbed vaults and frescos-is what wowed me. During our visit, the medieval frescos were being restored. To watch the artist working so meticulously cleaning and repairing these stunning frescos was a true treat for me! From Sao Sebastiao we headed to the town of Praia da Vitória. This larger town features the only sandy beach on the island. But what captivated me was the Church of Santa Cruz. Built in 1456, this is one of the oldest and largest churches on the island. Its façade is a mix of the late Manueline/Gothic style. The Church is so simple yet elegant with its white washed exterior and cheerful yellow trim. We couldn't wait to go in. The inside was full of amazing treasures. The gilded chapel is truly amazing. The book lover in me was enthralled with the sacred treasury of old books and vestments. Stunning! The most incredible wooden organ and chandelier decorate the nave of the church. 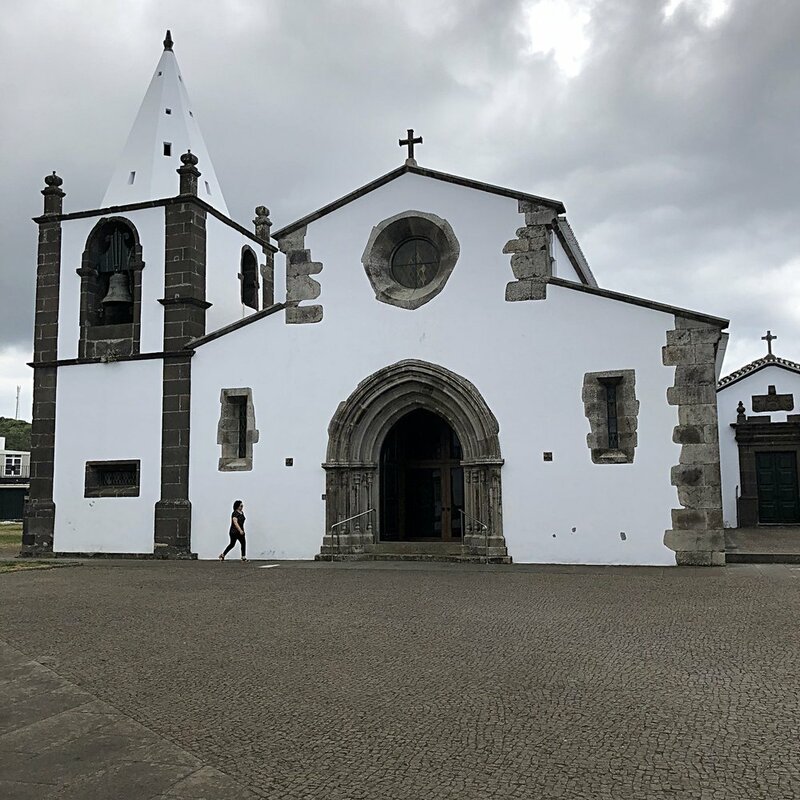 The caretaker of the church gave us an impromptu tour while exuding the friendliness of the Azorean people that we encountered throughout our stay. While Praia da Vitória has a long sandy beach, the rest of the swimming areas of Terceira are very different. Each town has its own natural swimming hole formed from stone and rock. Each one is very different in size, color, and details. My fave is Praia dos Biscoitos ( or Biscoitos Beach). Any visitor to Terceira must visit this spot! There is actually no beach here but instead many natural pools made of black, volcanic stone. Ladders and ramps have been added to aid in the swim experience. Near the parking lot several different small shops sell food and trinkets. The best donuts are sold here which of course we happily sampled! It is easy to spend a day in this natural swimmer’s haven. One of the highlights of our trip was a visit to Algar do Carvao. We had no idea what to expect as we traveled away from the coast passing countless fields of bulls and cows. The landscape approaching Algar do Carvao is beautiful and lush. It didn’t give any clue of the natural wonder we were about to experience. 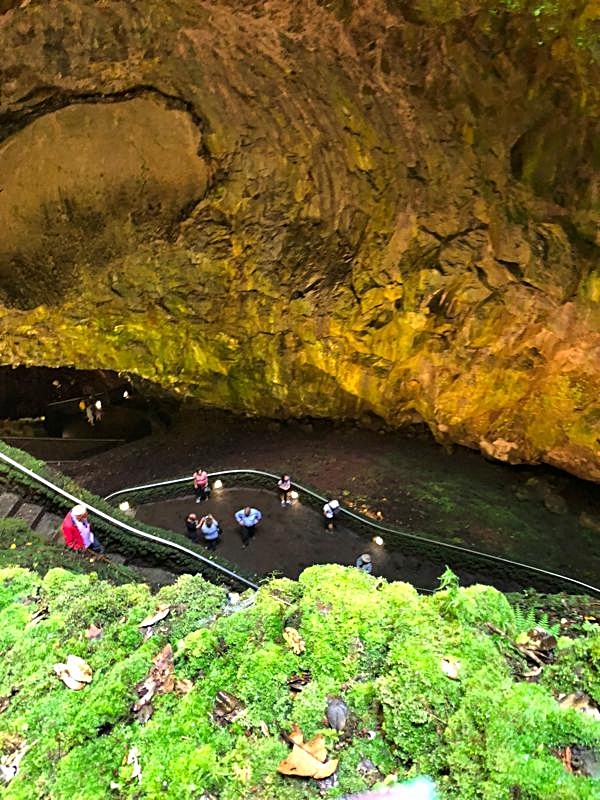 Algar do Carvao is a 90-meter volcanic chimney formed 3200 years ago. This is one of only 3 dormant volcanoes that people are allowed to walk down to the bottom. The other two are in Indonesia and Iceland. We had visited the one in Iceland before so were excited explore this Azorean site. The cave walls were formed from dark, black magma that drained from the main volcano chimney into the magma chamber. To enter the volcano, visitors first walk down a long tunnel; my 6’5 son barely fit. After the tunnel, a staircase winds down the chimney two the caves, magma chamber and lagoon that sits at the bottom. The effect is stunning; any direction you look is a stunning sight of stalactites and stalagmites. Bring a sweater; the temperature drops as you descend 330 feet. While we did a lot of touring on land of both natural and cultural sights, we also decided to head out for some what watching on the Atlantic Ocean. The Azores is one of the largest whale sanctuaries in the world. Over 20 species (both migrant and permanent) reside in the waters surrounding the Azores. The Azores lay right on the migration path of whales. Best time to see this majestic creatures is at the end of winter. We were lucky to see up close several different species of dolphins who also inhabit the waters. Our trip to the Azores was filled with Portuguese culture as well as incredible natural sights both on land and sea. We loved our visit especially our time in Terceira! Each island has its own flavor; we were so happy we visited 2. (More on Sao Miguel later). For anyone looking for adventure, incredible outdoor activities, and Portuguese history, The Azores is the spot to visit.